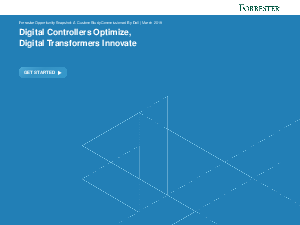 In December 2017, Dell commissioned Forrester Consulting to conduct a study refresh to determine how enterprise organizations are structured from an IT departmental perspective. The study explored two types of IT: digital controllers and digital transformers; and the trends and challenges seen in PC provisioning. Digital controllers are often associated with top-down approach, linear structure, and emphasize security and accuracy. In contrast, digital transformers focus on innovation, employee-and customer-centricity, and prioritize speed and flexibility. By understanding the two groups, enterprises can overcome challenges that arise from PC life-cycle management. By investing in existing PC management tools and partnering with a company that specializes in PC deployment and management, firms can empower employees to better serve customers. Download this Forrester report to learn more about the approach and strategy differences in how these two groups address the dynamic digital demands of a highly mobile and demanding workforce.